Matt Weiner's research department on Madmen is one of the best in the business. And to Weiner's credit, he's a stickler for detail. Many of the shows were built around real life headlines. See a passage from an AdAge article this week. 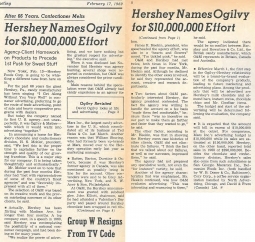 Hershey Names Ogilvy for $10,000,000 Effort During the episode last week's episode, Roger Sterling seems indifferent to find out that Ogilvy had signed Hershey. O&M did in fact win the $10 million account on February 13, 1969. Madmen has been great for the ad profession. The older viewers are able to watch and say "I remember that!". Younger viewers take it in and probably comment on how a sixty second commercial seems like an eternity. Here is a bit more flavour from that era. Fred and Barney hyping beer. They promoted cigarettes too but that's another story. In what may seem like forever, here's a 4 minute promotional movie created to target "the working man". It was created by Flintstones creators Hanna Barbara through St Louis ad shop Gardner Advertising. The only thing missing is the absence of the the live dart bird saying "Eh..it's a living." And the beer that made Milwaukee famous is still going strong. In the late 1960's they started with a guys guy, let's gargle some rusty nails, you only live once theme. Here's a perfect example, although I highly doubt Tahitian maidens were actually pouring Schlitz regularly in the backwoods of no where. If you have an interest in brewery history, check out the book Schlitz Brewing Art which features the famous brewery prior to being torn down in Milwaukee. As MadMen works towards it's conclusion, I'd be very surprised to see Don and whatever ad agency he ends up with not making a pitch for a brewery. Unless of course, the Canadian Club account comes up for review. We hear urban legend stories about well known celebrities or pseudo celebrities who are "difficult" to work with in a studio or on set. Hearsay really has no merit unless you were there and experienced it first hand. But when the proof is committed to tape, there's no denying some people are "problem children" in studio. Today - Classic Meltdowns during a recording session. Our first one is the late Jack Palance. He had a bit of a resurgence in his career after Billy Crystal cast him in City Slickers some 20 years ago. He was famous for his one armed pushups at the Academy Awards. But he also had some baggage that he obviously brought to this record session. Next up, it was no secret that Orson Welles could be "difficult". How he could have been THIS difficult, one can only guess. We all wake up on the wrong side of the bed occasionally. This rant sounds like he never went to bad at all the night before. Casem Kasem, who retired in 2009, had hundreds of hours of air time logged over his long career. He is worth over 80 million dollars, estimates say, so he obviously knew how to keep it together. But this was one instance in which he definitely had a bee in his bonnet about something and some things had been piling up which he was about to get off his chest. 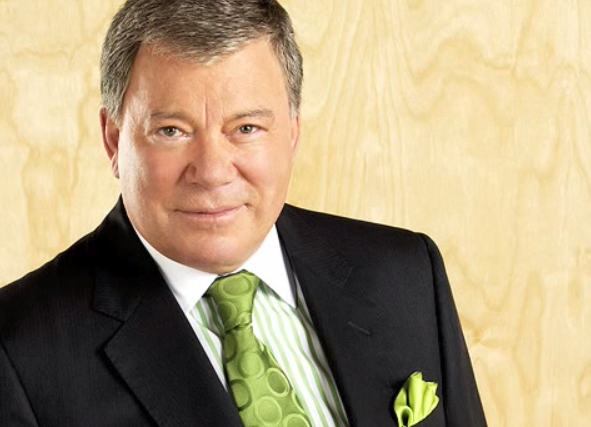 William Shatner has been a spokesperson for a number of products and definitely knows his way around a studio. This young producer thought he would do a line reading for Captain Kirk. Not a good idea. Have a rant we missed? Do share it and we'll feature it in a future "Classic Meltdowns in Studio" feature. We all have our days when we just know deep in our guts we shouldn't be anywhere near people. But when circumstances require it, the end result is truly entertaining. Thanks to Chris Seguin for the source clips for today's blog.